Digimon: System Restore: Data Squad Episode 26: Memory is the First Thing to Go! To nobody's surprise, the establishment is firmly behind Kurata. The moment they pop back into the real world, Marcus, Thomas and Yoshi are accused of treason and have their memories erased. 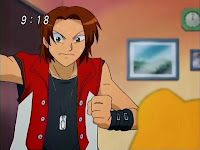 As a result, the Digimon get to take command, escaping from captivity and fighting to remind their partners who they are. While we get to enjoy the Digimon, particularly Kudamon, showing some personality out of their partners' shadows, you can't help but feel like this episode is manufactured solely to justify a clip show. While it's a very seamless clip show compared to disasters like the first Apocalymon episode, there is still far too much content recycled from previous episodes to be enjoyable. That makes it harder to get behind impact moments like the Digimon gaining the resolve to escape or Agumon knocking sense into Marcus. The idea of Hashima erasing the Data Squad's memories is a strong one that serves as a sturdy bridge to the second half of the series. It just has a few holes in it. For starters, there is no logic in both the decision to erase the memories of Marcus, Thomas, and Yoshi and the decision to erase nobody else's. The trio aren't back five minutes before they are zapped and left to resume their normal lives. The last part is key: that means discharge and memory loss were the only punishments. The significance of that is that this punishment was carried out so quickly. No chance to examine the evidence, no testimony from both sides, no trial to sort it all out. The three are arrested, convicted, punished and released in an instant, all due to an anonymous tip. Even if Hashima wanted to investigate afterwards, he can't ask the Data Squad for their stories if they can't remember them. Hashima's rash action here is even more poorly conceived than putting Kurata in charge. Not only did they prematurely wipe the memories of Marcus, Thomas, Yoshi and their families/butlers, but they elected to leave Keenan, Miki and Megumi alone. It's possible that only the active duty Data Squad members are considered the traitors and the other three are mere accessories. If so, then why are they locked up at DATS headquarters while the three perps go free? Keenan sort of makes sense since Hashima's always had it out for him, but Miki and Megumi? It would be very hard to argue any wrongdoing on their part. On the other hand, if Hashima considers all six of them culpable, then shouldn't all six of them get flashy-thinged? 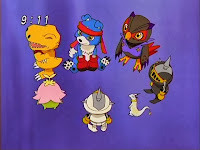 All six Digimon are locked up together, along with Kudamon who is able to take more of a leadership role now that he's not attached to Sampson's neck. This ends up being one of the more entertaining parts of the episode, as even though all seven have a common cause, it feels like a merging of factions. 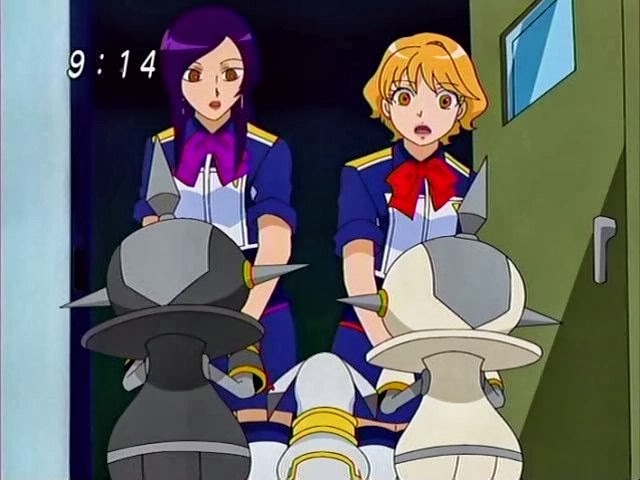 Agumon, Gaomon and Lalamon are worried about their partners and eager to get the hell out of there. Falcomon is with them, but as the new guy he's bewildered by Hashima's actions and more frantic and confused than the rest. The PawnChessmon are silent and agreeable, while Kudamon's clearly not used to dealing with the grunts on the shop floor. Agumon's insane plan works and they escape, with the main three setting out to restore their partners' memories the hard way. The memories are powerful enough to cause headaches when directly confronted with them, and it ends up being a far more simple task than the second Men in Black movie lets on. We follow Agumon's plight as he works his way back into Marcus's family, finally jarring the memories with (what else?) a punch in the face. I'm more curious as to how Gaomon and Lalamon pulled it off... and each took out a Gizumon AT identical to the one that gave them fits last episode. How exactly did they get back to DATS headquarters from the Digital World? 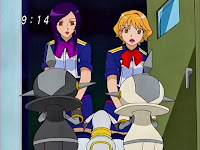 Unless they went back to the original dive point, they should need Miki and Megumi to triangulate their position and return. Otherwise, they have to use the open gate in the cave, but that would plop them into the harbor again. Kudamon says Sampson was suspicious of Kurata the whole time. Yet he did nothing to try to warn Hashima or sabotage Kurata's mission. Incidentally, pretty sure this is the first time we see Sampson's digivice... and it looks pretty badass! While it provides for a terribly easy solution to the episode's main conflict, the idea that the lost memories are still buried in the subconscious worked well. It emphasizes how important these memories are to their holders and sort of seems more feasible in the context of understanding the mechanics of the flashy-thing. That said, those guys must have worked quickly to flashy-thing Sarah, Kristy and the butler. I mean, seriously, they were thorough enough to include the butler!